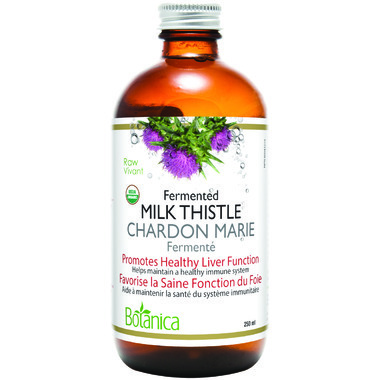 Botanica Fermented Milk Thistle contains bio-available phytocompounds which help promote healthy liver function and support detoxification. These compounds also have anti-inflammatory and antioxidant effects in the body. Directions: Take 20 mL (4 teaspoons) per day. Can be mixed with water or juice. Ingredients: Fermented Certified Organic Milk Thistle infusion (from 400 mg Silybum marianum seed), 1.2% organic acids (per/par 20 mL). Consult a health practitioner if pregnant or breastfeeding. This is a raw food that contains active culture. Strands of culture may naturally appear. This is working well so far . But I will know better in the long run. Great liver detox in a natural, organic and fermented form. Highly recommend to anyone suffering from multiple health problems. Help your body to cleanse itself. Excellent product . It's organic and fermented .